This morning I attended a conference called Business is an Adventure, which was hosted by Virgin Atlantic and the Barbados Chamber of Commerce. The panel included regional academic and business leaders alongside founder of Virgin Atlantic, Sir Richard Branson. Now those who know me well, are well aware, that next to Oprah, Sir Richard is a successful individual whom I admire and always refer to as a benchmark in discussions on groundbreaking business achievements, impactful branding and marketing campaign execution. I believe my long-standing affection for the Virgin brand blossomed in the ‘80s during my childhood, when I saw the bright shiny new aircraft, with TV’s in the back of the seat. I had travelled on planes during my youth and realised I couldn’t see a damn thing on the tiny screen elevated for communal viewing. After watching the first Virgin Atlantic TV commercials unveiling this innovative technology, all I knew is that I had to get on that plane! 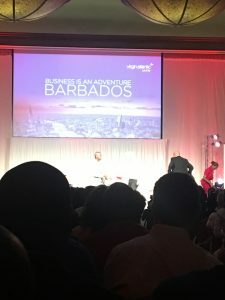 Fast-forward a few years and then the announcement was made that Virgin had included Barbados to their destination offer. I clearly recall my grandparents’ excitement at the new airline option travelling to their homeland from the UK. Sir Richard had hit a home-run with that one according to my household and I naturally adopted their admiration. Over the years, I witnessed him venture into diverse business industries such as health (Virgin Active), broadcast (Virgin Radio), telecommunications, (Virgin Media) and events (V Festival), which I am yet to attend. He even extended his airline fleet with Virgin Nigeria – which, I might add, had an extra luggage allowance, cos I know his Nigerian team advised Mr. Branson, travelling light for us black folk can sometimes, be a challenge!) YAAAASSS Sir Richard! As I progressed through school, college and university I aspired to work with at least one of the Virgin brands. I even got to the stage of being invited for an interview with the airline to work in their headquarter’s marketing department, but alas nerves and I believe lack of experience, at the time, did not allow the opportunity. I can laugh now, as I remember travelling home from that interview, absolutely crushed that I had let nerves get the better of me and some random American tourists giving me a pep talk on the train about not feeling too bad and to “try again” Bless them! I can’t even remember how our conversation transpired; probably because I was practically curled up in a ball of self-pity on the Gatwick Express to Victoria station. LOL! But I digress! 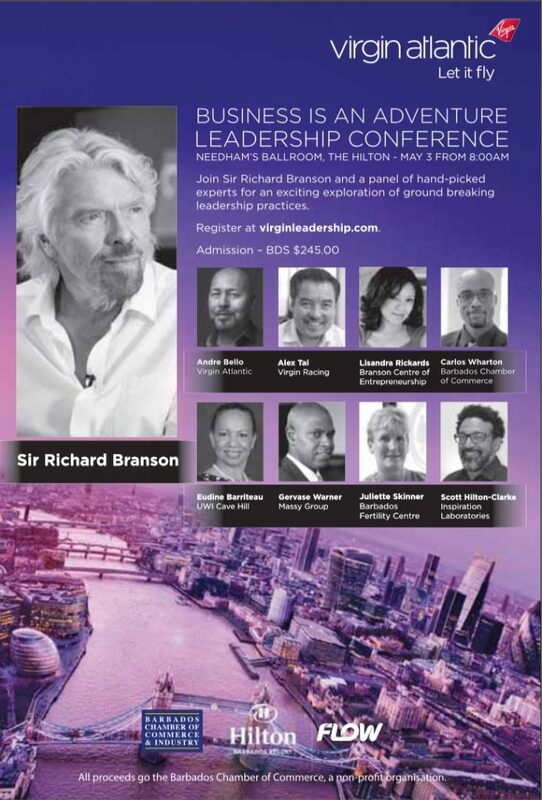 So that back story makes it clear to you, that after seeing an ad in the newspaper announcing Sir Richard Branson, would be in Barbados for a conference, I just had to attend to hear from Uncle Richard himself! (Yes it’s that deep that I affectionately call him Uncle Richard). The conference, was indeed valuable, with the panel each giving examples of how they achieve business success, and advising on just some of the rigid business structures and perceptions that need not apply. There was also a clear focus on the need to build a strong team, to delegate tasks according to each person’s strengths and communicate clearly to each individual how they add value to the team and the business’ overall mission. I will be honest, most of which he shared I was aware of because I’ve read his autobiography, subscribed to the blog and watched a fair share of YouTube videos with Sir Richard talking at various events. My time, however, was not wasted as the session was inspiring as Sir Richard also shared that his focus on philanthropy included activities relating to the environment and helping entrepreneurs around the globe. All of which complement his mission to “Change Business for Good”. My main takeaway was that it is perfectly ok to be an effective leader, without compromising your authenticity, as long as you build a strong team, add value, lead by example and maintain excellence as your goal. Thanks to the team and Sir Richard for your pearls of wisdom.